1. The January minutes were approved. 2. Martha Sheldon reported for Ministry and Counsel: A request was made to assist a home-bound member to safely traverse her walkway; a neighbor volunteered to help with this request at no cost. The committee discussed the pastoral care needs of the meeting with the aim of cultivating an environment for people to volunteer or test callings to meet certain pastoral needs. 3. The ad-hoc working group on Strengthening Durham Friends Meeting presented us with a two-page report (attached) which summarized what they heard at the January monthly meeting, and a proposal on how to proceed. They concluded that three areas need attention: pastoral care, outreach, and coordination. Ministry and Counsel is asked to consider how to best proceed with pastoral care and make recommendations to monthly meeting. It was recommended that the Clerks Committee meet on a regular basis to address coordination of meeting activities and committees, and report to monthly meeting. It was suggested that we have a discussion on outreach at the March monthly meeting. 4. It was approved that we include the full report in the Newsletter and approved that significant time be allotted for discussion of outreach at the March monthly meeting for business, with the hope that many people will be present. 5. Kitsie Hildebrandt, treasurer, brought the 2017 Finance Report. 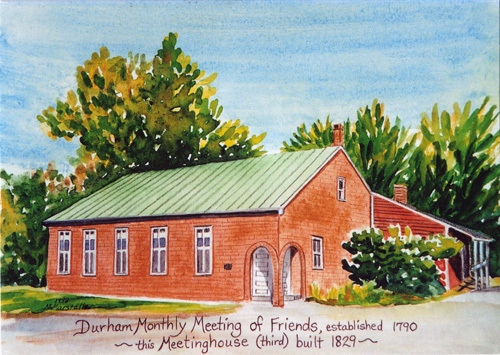 In a nutshell, the meeting spent $40,199 for committees, contributions, meeting expenses, meetinghouse and parsonage physical plants, and youth ministry. The income for our Operating Account totaled $54,021. Capital expense (meetinghouse roof, solar panels and heat pump) were mostly funded by grants and fundraising. Reports included source of funding, accounts list, operating expenses, and other accounts (designated, charity and capital). All these reports will be attached to these minutes. We accepted, with gratitude, this report. 6. The Peace and Social Concerns Committee report was given by Brown Lethem. They wish to initiate a period of exploring our meeting’s heart regarding the Quaker Peace Testimony with three suggestions: they recommend that the Friends Committee on National Legislation booklet, The World We Seek be discussed as a meeting; that we connect with the Seeds of Peace Camp; and discern a whole meeting project that we can support with a corporate mission. 7. It was approved that we discuss the booklet, The World We Seek during the Adult Sunday School hour (9:30) for the first three Sundays in March and conduct a special discussion after meeting on March 25. An announcement will be included in the Newsletter and booklets will be distributed. 8. We received a report from Leslie Manning for Trustees that the basement window installation is partially completed, and the heat pump is repaired and covered. 9. Tess Hartford reported for the Christian Education Committee: the game night/pot luck held on February 10th was enjoyed by all who attended (19) and they hope to continue this activity on a regular basis. There will be an Easter Breakfast April 1st and activities for children. 11. A brief discussion ensued concerning the ticking clock in the meeting room. Although the clock is much loved by some, others find the tick-tock noise to be a real distraction from centering down. Further conversation is needed about this, but it was decided, for a trial period, to replace the clock with a silent one during the month of March. The clerk closed the meeting, expressing gratitude for worship, love and care in our gathered business meeting.